I don’t know about you but once the Spring weather arrives, I don’t want to be in the house! In fact, I need to get going on the rest of my Spring Bucket List! Backyard BBQ’ing is one of my favorite things to do when I feel like chillin’ at home with Chuy! It’s a great way to make an irresistible dinner while spending time with my boos! Of course, a margarita or two doesn’t hurt either! Here are five tips for an irresistible backyard BBQ with your dog! 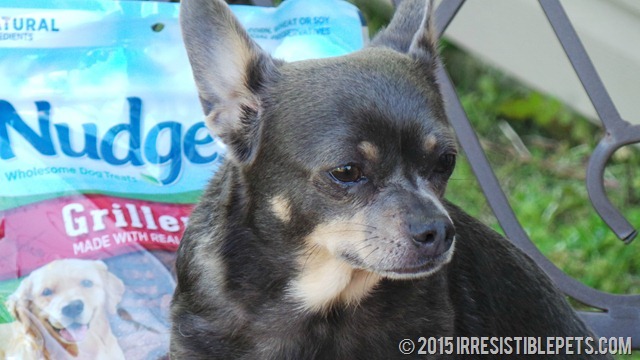 If your dog is anything like Chuy, they probably go nuts whenever you are grilling meat! Chuy’s nose literally doesn’t stop moving! It’s a great idea to have some kind of dog friendly treat available to help deter them away from the human food . . .although there are no guarantees! 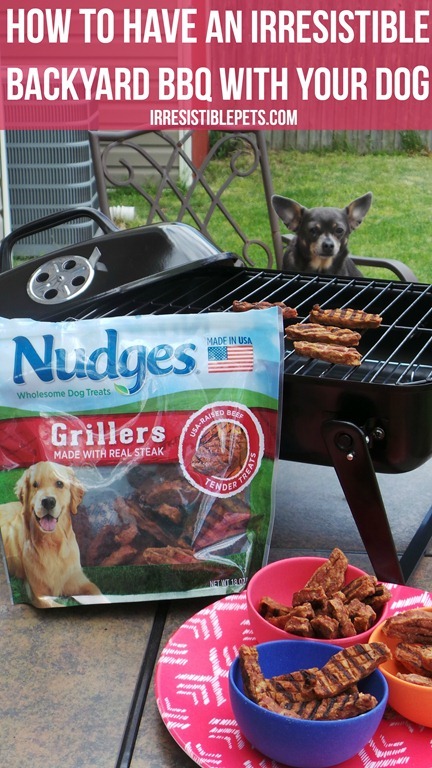 To go along with the BBQ theme, I’d like to recommend Nudges® Grillers or Nudges® Sizzlers as they are made in the USA and the#1 ingredient is REAL meat! 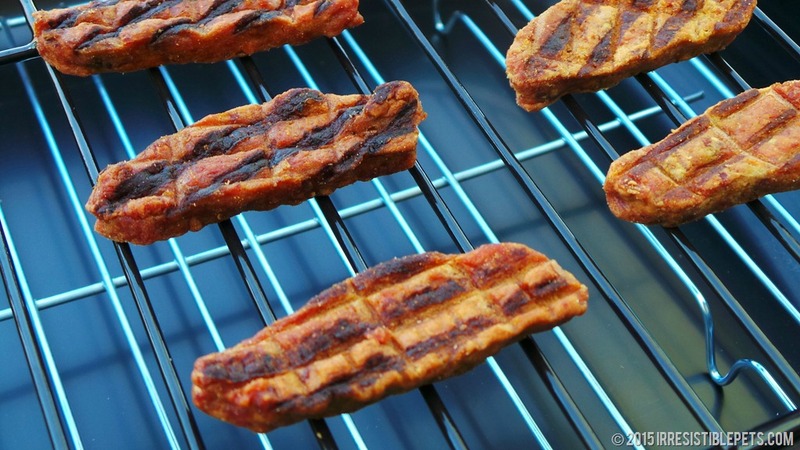 In fact they look just like meat from the grill but they are for dogs! 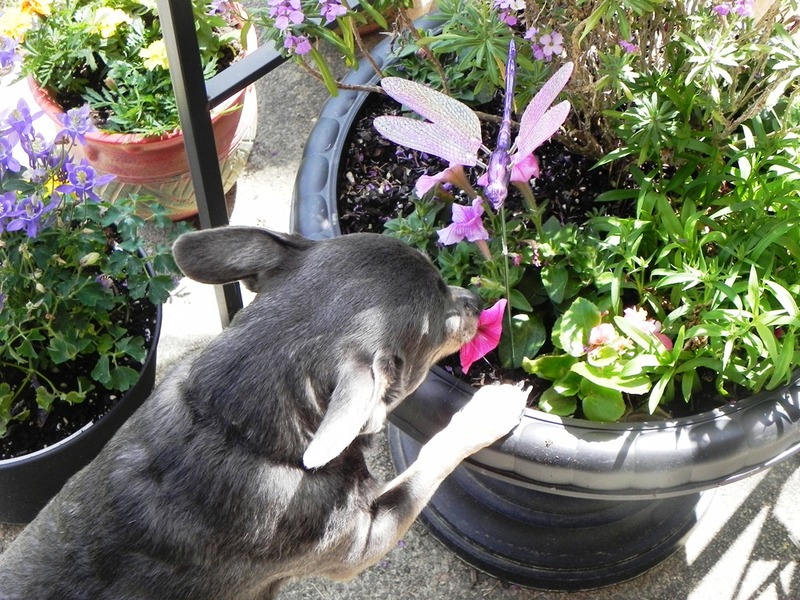 Chuy is loving them! I love that he can be part of everything we do including a backyard BBQ because he is not just a pet . . . he’s our family! You can find Nudges Grillers and Nudges Sizzlers at your local Wal Mart in the pet treat aisle. They come in both Steak and Chicken flavors. Like I just mentioned the smell of all those irresistible flavors coming out of the grill can be tempting! Designate someone to be the “grill master” to keep an eye on the grill and to make sure that your dog doesn’t knock it over. Always keep the grill and fire away from your dog. An overturned grill is no bueno!! 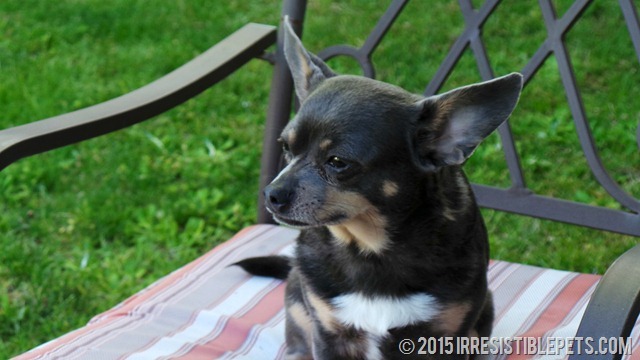 If you have a sneaky little pup like Chuy, be sure to keep the chairs at a safe distance from the table or grill! Chuy will jump up in the chair and try eat everything in sight. We are constantly having to keep our chairs pushed in at the table! If one person is taking care of the grill, play some outdoor games like fetch with your dog. 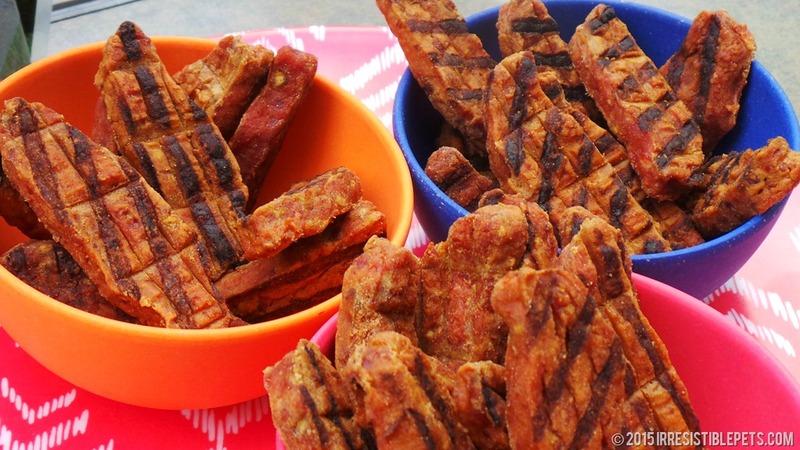 This keeps them from obsessing over the grill and burns calories at the same time for both of you! Keep the food and treats in an area your dog can’t reach but make sure they have an easily accessible water bowl. Don’t forget to enjoy the moment and just have fun with your family and your dog! I like to put on some music, light some outdoor citronella candles, turn on the water fountain, and flip on the string lights. It’s all about the ambiance! Life is about making these irresistible moments that you want more of. 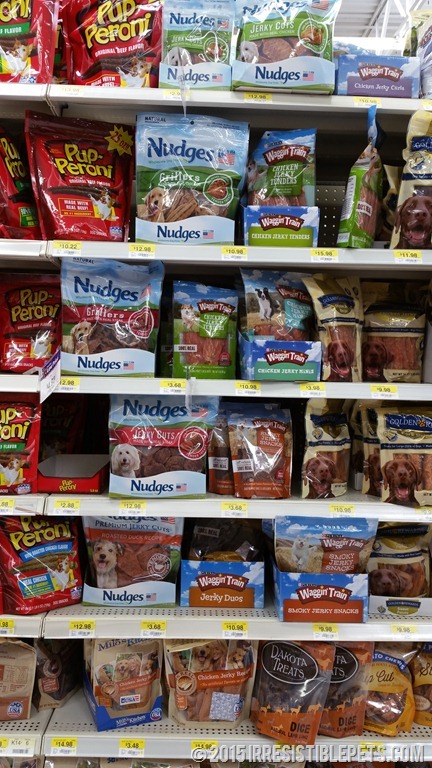 Be sure to please check out today’s sponsor Nudges at NudgeThemBack.com and NudgesDogTreats.com to learn more about Nudges Sizzlers, Nudges Grillers, and their new Jerky Cuts, all available at Walmart. You can also visit them on Facebook for more updates and info. Which Nudges flavor would your dog find irresistible? 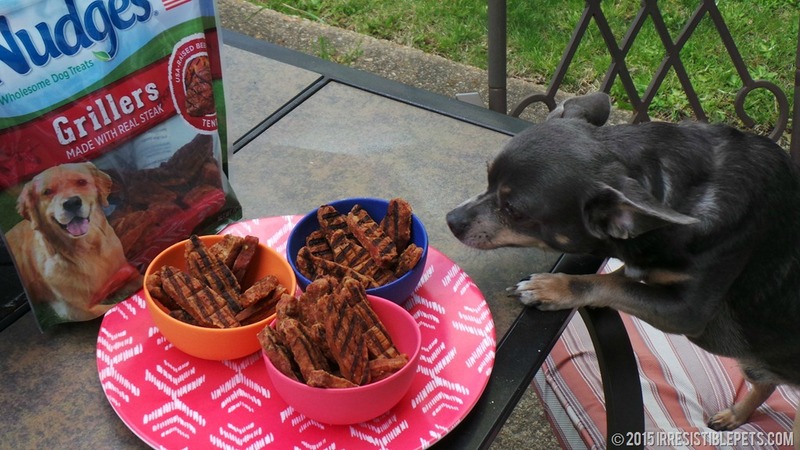 Do you have any tips about backyard BBQ’ing with your dog? Leave me a message in the comments below so we can chat!